My name is Asha and I'm a stationer and watercolour artist. 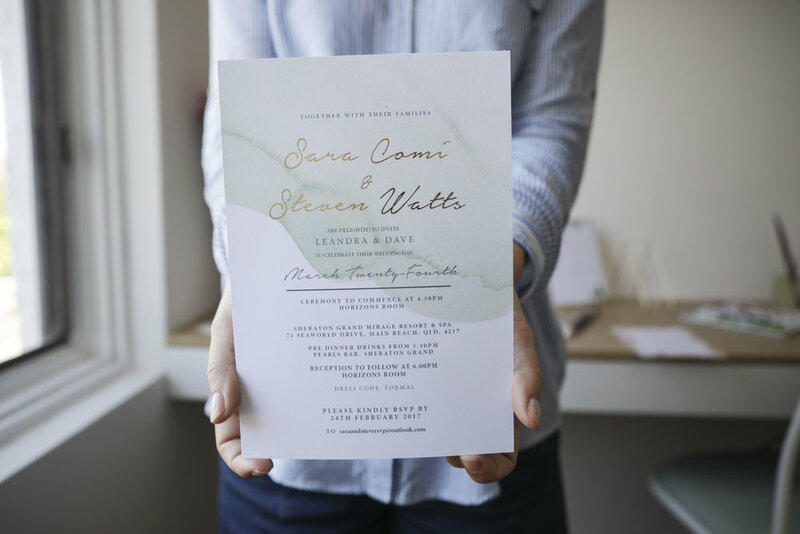 I run my own business specialising in wedding stationery and previously worked as a commercial Interior Designer in a local firm. Hmmmm that’s hard. At the moment a terrible friend who has no time :/ ! But probably fun, little quirky and often doesn’t think before I speak, which is always fun in itself…. Brave. I feel like the biggest thing that got me to where I am now was being brave, having faith, not listening to too many opinions, choosing the ones that count and not always listening to common sense. I quit my full-time job at an architectural firm based in Subiaco and threw everything I am and my pride on the line to start my own business. I studied while building the business and then launched Wedding and Colour 6 months later. Be brave, it may not look like you thought, however, its always worth risking otherwise you will always wonder why. Ask yourself. What’s the worse that can happen? You fail. My husband used to always say that to me, I had to brain storm what it meant to me if I did fail….Your mind is cruel and always makes it much worse than reality. I probably wouldn’t change anything; even, mistakes have only helped e learn and grow in my business but also personally. I’m still finding it, the wedding industry is big! But its finding it with the right people and net working with the right people, people who aren’t even within the same industry. I found connecting with other small business owners helped so much in learning and growing from each other. Days it was hard but I’m a pretty driven person. Lists! Lists always help. I have a white board that I write my weekly and monthly tasks on. I post it note all my jobs so I can visually see my work load, this helps me stay on track. Also learning not to procrastinate, starting with the hardest task and working my way backwards. Spaces, beautiful spaces. I think the Interior Designer in me appreciates all type of design so I am inspired by beautiful interiors, colour palates, textures in nature etc. Renovate. I love creating something from nothing so my other dream would be to flip houses or just live in Italy and paint haha.